the plenary sessions much easier to understand and for some of the other technical sessions I found that oftentimes, even though I understood the words, I didn't understand much of any of the details. 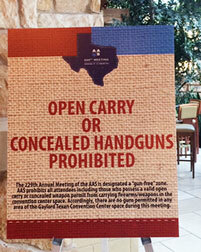 As an aside, just walking from the hotel to the convention center, which by Texas standards was close by and connected with a covered walkway, I noticed the following sign announcing a gun policy that I had not seen before. See below. Hey, we are in Texas and this sign really caught my attention. I guess the meeting planners are afraid of something? Maybe too many Texans? I don't know. There has been a history of events where discrimination and harassment occurred based on the early mostly male environment of professional astronomy. Vera Rubin, who recently just died, a great scientist and major discoverer of the effects of dark matter on galaxy rotation curves, was apparently one of many, who were harassed and discriminated against because they were women. 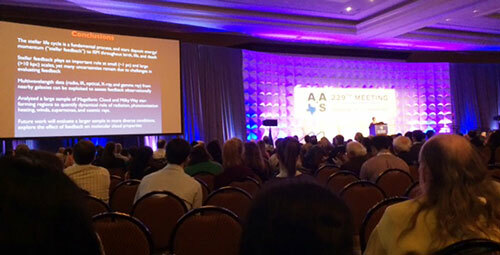 As a result the AAS does a great job of being very inclusive and wants to include all people, women, minorities, LGBT persons of whatever background, which I certainly agree with. But, I hadn't noticed any previous gun violence. 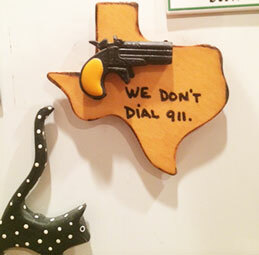 Texas and I usually felt pretty safe here. Oh well, on to the meeting and I wanted to provide just a brief summary of some of the takeaway notes I took during the plenary sessions. I wish I had the actual presentations for review and clarification, but I hope these summaries will be useful for those who could not attend this meeting. Ok, that is all I could make out of my notes. There was much more, but I couldn't follow it fast enough to write it down. Again, I would have liked to have copies of the presentations. I probably have missed major points and misinterpreted others, but, hey, if you want to get the real deal, its your job to show up at the next meeting! 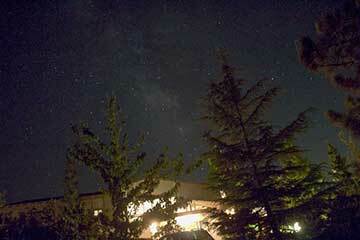 Like I mentioned in previous posts, I get caught up in trying to understand the units (e.g,. galaxies per megaparsec per Kelvin per centimeter squared per steradian, or some such thing) and I can't follow the rest of the discussion. Oh well, I just keep learning and trying. So that is it for this very long first day of the meeting.